You already have a heat pump in your home – your refrigerator. If you put your hand behind it, you’ll feel the heat that’s being pumped from the inside. How It Works: Anatomy of a Heat Pump. It’s the same principle that a geothermal heat pump uses to warm your home. During the winter, the reversing valve switches the indoor coil to function as the condenser, and the underground piping to act as the evaporator. In short, the indoor coil and underground piping cause the refrigerant to change state, absorbing and releasing heat through boiling and condensing. 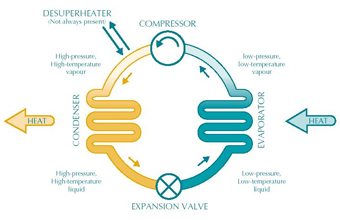 The compressor and expansion valve move the refrigerant through the system by changing the pressure. 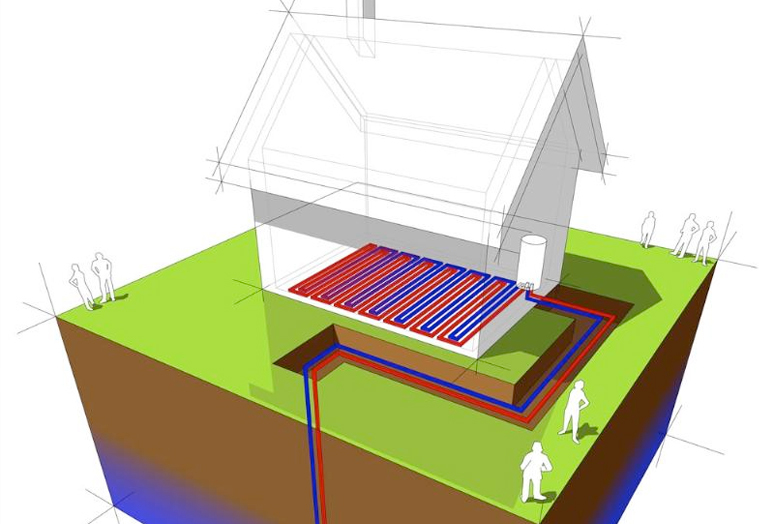 The most common type of geothermal installation is a closed loop system. The heat exchanger – a loop of piping filled with fluid – is buried underground. The fluid circulates continuously inside the buried pipe, absorbing heat from the earth during the winter for use inside your home or business. In warmer months, the fluid takes heat from indoors and transfers it back into the earth. A central closed loop system has all heat pumps in a central room; air or water is ducted and circulated to the heated or cooled rooms. Commercial applications include chiller or rooftop unit retrofits. Distributed systems use a central water pump and heat pumps serving individual rooms and areas. Types of buildings served included offices and schools, both new construction and retrofits. Since multiple units are heating and cooling simultaneously, the distributed system can provide heat recovery from core zones that have excess heat to perimeter zones that require heat. A distributed system also permits location of relatively small individual units in restricted areas, such as historic districts. Modular systems have dedicated heat pumps, water pumps and loops. This type of system allows for independent individual control, operation and maintenance. Types of buildings suitable for a modular approach include schools, with modules serving individual classrooms, and other buildings where usage and environment are clearly separated. A hybrid system uses a cooling tower or other means to reject excess heat not needed for winter heating. The cooling tower reduces the size of the ground heat exchanger and the cost of installation.